A brilliant blue bridge crosses the Etang de Berre in the town of Martigues along the Cote Bleue in the Provence, France in Europe. 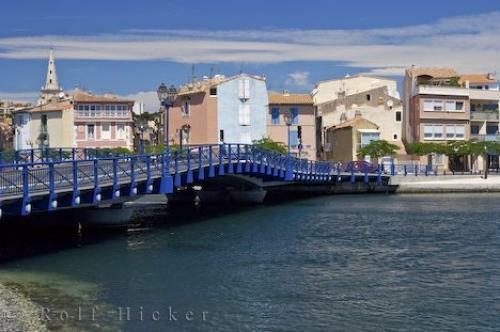 Photo of the bridge at the entrance to the Etang de Berre in the town of Martigues, France in Europe. ... It is the most picturesque of the three and has the best selection of shops to buy your gifts or souvenirs from while visiting Martigues, France.The town of Martigues, France has recently undergone some major industrial expansions but still remains a charming town of canals, islands, flowers, gardens and bridges.St Sebastienâ? ?s bridge at the entrance to Etang de Berre in the city of Martigues, Cote Bleue, Blue Coast, Provence, France, Europe. I photographed this photo with the digital SLR camera model Canon EOS-1Ds Mark II, aperture of f/8.0, exposure time of 1/160 sec. on ISO 100, as always I used a original Canon Lens, the focus lenght for this picture was 62mm.